Today we are doing another diy project. We all know that skate leashes are a great thing to have. 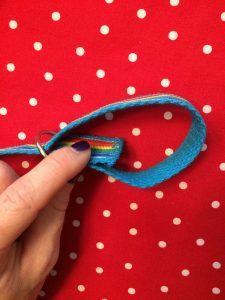 Of course you can buy them at your favorite skate supply store but if you are in a crafty mood, own a sewing machine and have a few free minutes here is how to make your own. 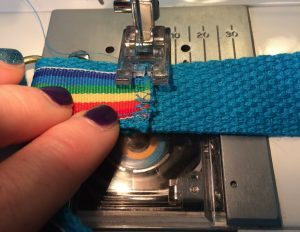 For the purpose of this blog post I’m going to assume you have a basic knowledge of a sewing machine and sewing. I bought all my supplies at my local craft store. 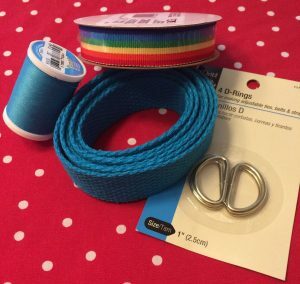 Because the ribbon came on a 9 foot roll and the D-rings in a pack of four I bought double the amount of belting (9 feet) and spent less than $11 after coupons for supplies to make two leashes. 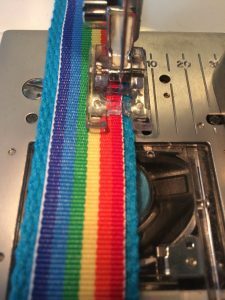 My first step was to secure the ribbon on the belting with a pin. 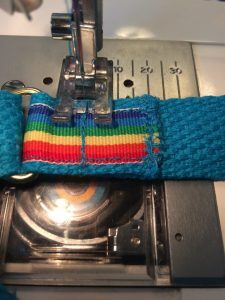 Then I sewed it on to the belting with a zigzag stitch. I made sure to go back and forth a few times. 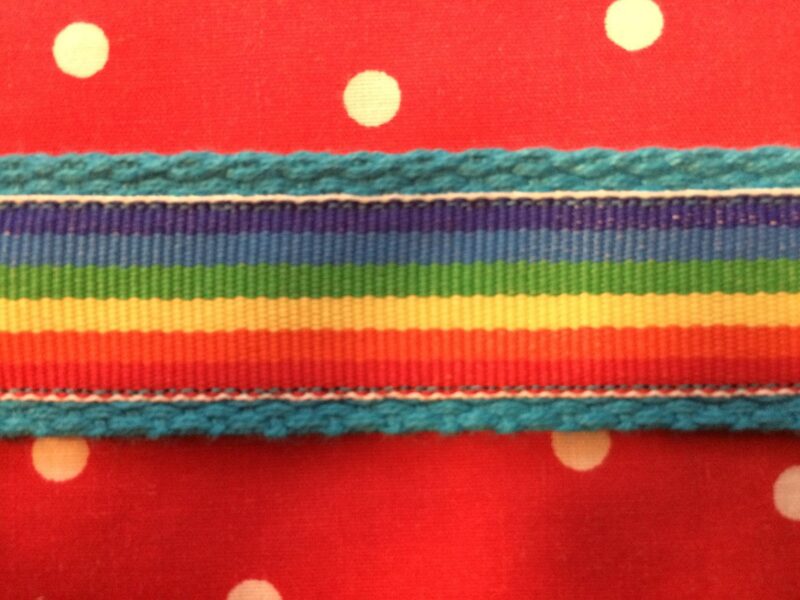 Then I stitched the ribbon on to the belting with a simple running stitch. 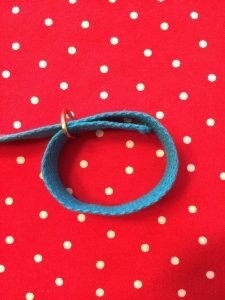 When I came to the end of the belting I cut the ribbon to the same length and repeated the zigzag stitch on that end. 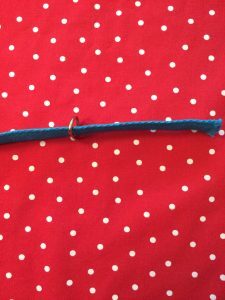 Then I sewed the other side of the ribbon to the belting with a running stitch. At the end I secured my thread and cut it. Next I grabbed my D-ring and slid it on the decorated belting. and then I folded the end over about an inch and a halff securing it with a pin. I did the same thing on the opposite side. To secure the ends I did a running stitch back and forth a few times in two places as you can see in the pictures. This is how it should look from the other side. I repeated that step on the other side and was done! Stay tuned for more Derby inspired DIYs and helpful hints brought to you by Bout Betties. The step by step images aren’t loading for me! I would love to make this, but I don’t see a final result picture. Hey Sarah, thanks so much for bringing this to our attention. We will work on getting the post pictures updated ASAP. I just made this and I think a 4.5 feet ended up being to long I think 3 feet might have been better. 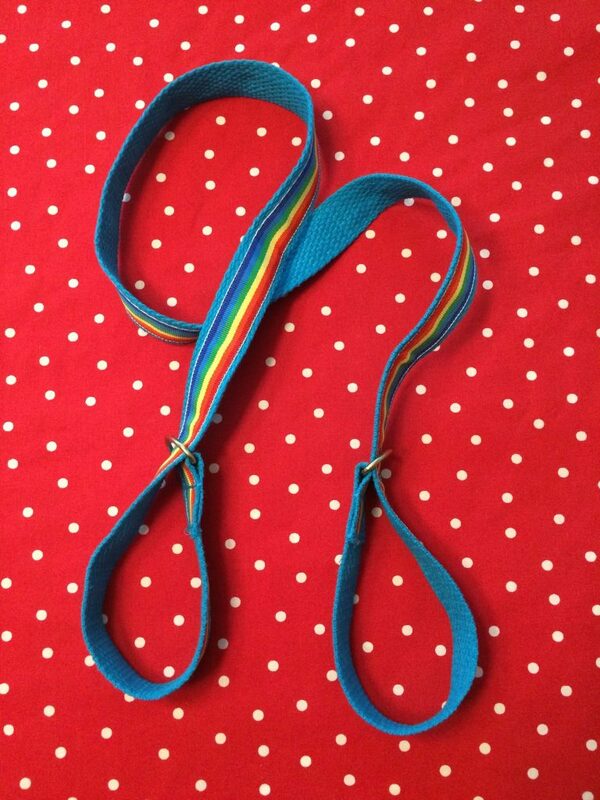 That’s a great hint for someone who likes their leash a bit shorter. Thank you. I’m so excited! I didn’t want a bigger bag for my derby gear. 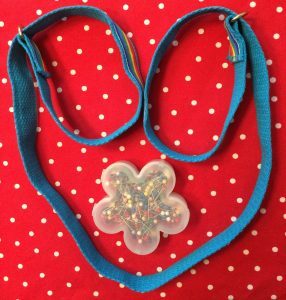 I made my leash in about 20 minutes using your measurements/pictures. Your directions were great. I thought it might be too long because I’m only 5′ tall, but it is perfect. Almost everything I needed happened to be on sale for 50% off at Hobby Lobby, so this cost me less than $4 to make.